Check out the latest and greatest news from Camp La-No-Che each month! Summer Camp 2019 at Camp La-No-Che! Reserve your CAMPSITE for $100 down! DOWNLOAD THE PARENT & LEADER GUIDE NOW! 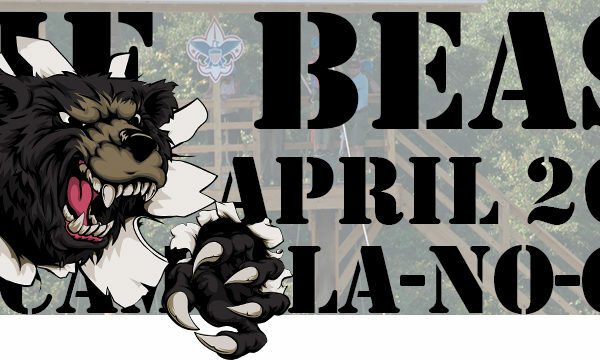 Experience Camp La-No-Che with your Den, Pack, Troop, Crew, or other group! Choose from one of our weekend events or just book a campsite for yourself any available weekend! Our feature programs, Camp La-No-Che offers long-term resident camps for all ages, from Tiger Cubs to Scouts & Venturers, in both summer and winter! What’s going on at Camp right now? Check out the calendar to find out! Click here to learn more about Camp La-No-Che! Camp La-No-Che is the premiere Boy Scout Camp in the Southern Region. With over 1600 acres of natural Florida forests, camp is home to many different kinds of wildlife as well as many different programs on weekends as well as our World Famous Summer and Winter Camp Programs! Scout Ranch is an incredibly large field primarily used for council wide events and camporees. The Scout Ranch has enough space to fit over 5,000 campers and various activities. Scout Ranch is also the home to several gopher tortoises! Adventure Camp provides an unparalleled high adventure experience! Consisting of low COPE and high COPE areas, be sure you don’t miss out on this once in a lifetime opportunity! Just down the road are the Adventure and Alpine Towers. Both have multiple static courses and challenges, even with dual zip lines that fly across Lake Pooh Bear! Adventure Camp is also home to the ATV program, offered throughout the year! This weekend was our first time, and definitely not the last. We attended Tiger Growl and my son had an amazing time! Probably the most memorable weekend of his life! The staff was outstanding! The food was wonderful! The place is absolutely beautiful! Thank you for an unforgettable weekend and we will see ya next time! We had the most amazing experience with our Troop [at Summer Camp 2018]. During class time while instructing the First Aid Merit Badge, we noticed your Staff’s ability to project enthusiasm and turn a dull subject into something the Scouts thoroughly enjoyed. We’ve been to many camps across the country (Scout camps and regular camps alike) and NEVER have we come across such a joyful, talented, and involved [staff]. We will definitely be coming back next year! The staff at the camp were all great! I witnessed 3 different staff members tending to children who were either lost or hurt and they did such a nice job with them. Very well run organization! We had a great time!! Matt has been the Camp Director for over 20 years at Camp La-No-Che, and is always working to improve the program so that it caters to all scouts and adults. Questions? Contact him at matt.ragan@cflscouting.org! Mike is the newest member of the La-No-Che family, moving all the way from Nebraska. Mike is working with our Council Program Directors to provide an “Unparalleled Experience for more Youth”. If you have any questions for Mike, you can email him at mike.evano@cflscouting.org. Mark is our Council Program Director overseeing Boy Scouts, Venturers, and Explorers. He’s also our Summer Camp and Winter Camp Director. If you have any questions for Mark, you can contact him at mark.spencer@cflscouting.org. Leigh has recently taken over the business aspect of Camp La-No-Che. Along with that, she is the lead on all Cub Scout programs at Camp. Questions for Leigh? Contact her at leigh.taylor@cflscouting.org. Pam loves working with others. Her responsibilities include handling reservations, checking in, and of course, coordinating activities on camp. If you have any questions for Pam, you can contact her at pam@camplanoche.com. Art is the ranger in charge of the Hendrick Camp side of Camp La-No-Che (East Side). If you need to contact Art, you can email him at art@camplanoche.com. Sam is the Camp Ranger in charge of Stine Camp (West Side). Tim is the Camp Ranger in charge of the Dr. Phillips Park region of camp. He maintains the pools, the dining hall, and everything in between. Camp La-No-Che is located on the Leonard and Marjorie Williams Family Scout Reservation in Paisley, FL. The Camp Office is open Tuesday through Saturday, 9 AM to 5 PM. The office can be reached at (352) 669-8558 by phone.